Picture from wicklore : The most famousTeddy in Ireland? Picture: The most famousTeddy in Ireland? Listeners to RTE’s Liveline programme may have heard me today as I discussed the chair and Teddy memorial on Slievecorragh and its history. The podcast can be listened to here: http://www.rte.ie/podcasts/2012/pc/pod-v-31011215 Hm15slivelinememorial-pid0-915192 I.mp3 Please remove the (point A) and (Point B) insert in the http link as these are generated by MountainViews thinking they are grid references! I initially gave a general background to the story without identifying the hill or Dan Clancy out of respect to Dan’s family. However Dan’s brother Andrew, who sculpted the chair, agreed to go on air and joined me in discussing the chair, its origin and memorials in general. It is particularly poignant as the anniversary of Dan’s death falls this week, and the chair has been on the hill for 8 years now. 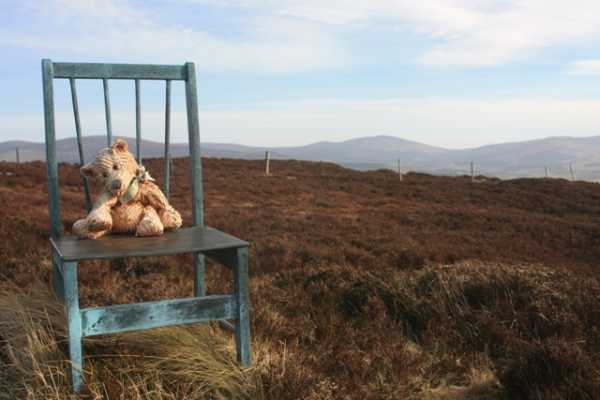 We were joined on air by a local woman who said she walks on the hill every week with her grandchildren and never knew the story behind the chair. She, like many of us, was touched to hear the origin of the chair. Once again it shows the value of MountainViews.ie in bringing the stories, history, and local knowledge of our uplands to the wider hillwalking public.